Laughter Heals – Here is How you do it video! How can laughter Heal Fear? Join us to consider what is your Fear and explore how Laughter Heals. Elaine Nieberding is a Laughter Yoga teacher and “ho-ho-holistic nurse.” She says: “It just takes a little TLC: timely laughter-care to bust fear — you know — False Evidence Appearing Real!” Watch the episode now and experience what laugher can do for you! Elaine hails from Maryland, USA (but she spells it M E R R Y L A N D, haha!) Since 1997 she’s served diverse groups in the Chesapeake Region of the US with holistic-care programs as a Reiki Master Teacher, motivational speaker, wellness educator, and even hospital bedside cancer-care nurse. Now her mission is inspiring leaders, visionaries and entrepreneurs to dump seriousness, shift from fear to love, and reignite playfulness in human relationships and daily self-care. 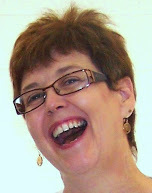 Elaine’s website is www.yesLAUGH.com and she’s passionate about the power of Hangouts for personal and collective transformation connections. Elaine produced and hosted 3 World Laughter Day Hangouts this May featuring Laughter Yoga Founder Madan Kataria and laughter luminaries from around the globe. Folks around the world got to practice “unconditional laughter” together all at the same time. Elaine Nieberding invites you to circle her on G+ and join in lively upcoming interactions on her new Hangout series *”The Holy ShiFt Show”*. Word-play, laughter and self-discovery processes will mix with unique conversations about the dynamic times we’re *waking up within*!